N a steamy afternoon last month, Dan Lenahan, a Battery Park City resident, gestured with his cane on the elevated walkway overlooking the World Trade Center site and told eight fellow New Yorkers why his neighborhood needed to remain separated from tourist crowds by West Street, a main artery that some people want to bury to make room for a memorial promenade. The meeting was remarkable not because any consensus emerged on how the area should be rebuilt ("It's so elitist," a Greenwich Village resident said of Mr. Lenahan's position), but because this physical gathering in Lower Manhattan arose from a debate in cyberspace. "We wanted to visualize it for ourselves," said Maria Grieco, a music teacher from Queens who took part in the online discussion, organized by the Civic Alliance to Rebuild Downtown New York as part of its Listening to the City initiative. Known to one another only by online aliases and argument, the members of the group - one of 26 in the program - stayed in touch by e-mail after their two-week discussion ended in early August. And if consensus did not emerge from their field trip, at least the perspective from Battery Park was clarified. "Maybe it doesn't have to be a physical reconnection," conceded Margaret Duffy of the Upper East Side of Manhattan, who sympathized with Mr. Lenahan's desire to be done with construction as the group watched dump trucks negotiate the hole below. "Maybe it could be a visual reconnection." A meeting at the Jacob K. Javits Convention Center in July at which 4,000 New Yorkers gathered to pass judgment on the original six plans for rebuilding the World Trade Center has been cited as an exercise in the very principles of participatory democracy, in which informed public discussion leads to the best decisions. Less chronicled is the experience of 800 people who could not make it to the Javits Center that day but instead convened over the Internet over a two-week period to discuss many of the same questions, at more length and perhaps with more nuance. The results of the online discussion were included with those of the Javits Center meeting in a report that the Civic Alliance submitted this week to the agencies responsible for the redevelopment, which have promised to study them closely. But the 10,000-odd messages produced by the online groups are also being scrutinized as a model for civic engagement on local and national issues. Some who have monitored the process suggest that online discussion may be a more promising way to promote democratic debate than a Javits-style town hall - in part because it is more practical. "You don't have to buy people lunch on the Internet or get them a free pass on the ferry to get there," said Robert D. Yaro, the president of the Regional Plan Association, one of the organizers of the Javits Center event and a member of the Civic Alliance. "And people could do this at 3 in the morning if that's when they were free." The Javits Center meeting cost about $2 million to produce; the online discussions cost about $120,000. Although the online dialogue was skewed toward computer users and involved fewer participants from ethnic minorities, it attracted a significantly higher percentage of people under 34. More than half of the participants in online and offline groups said that their opinions had shifted over the course of the discussions. Some organizers who tracked both processes say that by prolonging its discussions for two weeks, the online group allowed diverse points of view to be more fully explored. Rapport often developed instantly in their virtual communication, seemingly from the sense of safety people feel as they type into the ether. "At Javits, there was no bouncing of ideas: we just went around the circle and each person had their say," said Cynthia Schmae, a consultant for Web Lab, a nonprofit organization that specializes in online communication and ran the Web discussions. "You didn't have time to get to know each other so you don't have that flow." The meetings in Lower Manhattan and in cyberspace were organized against a civic backdrop in which Americans, particularly the young, are voting less, volunteering less and paying less attention to public affairs than those before them. Some advocates see the Internet as a potential lightning rod to encourage more civic involvement. "In a democracy you want people talking about public issues," said Michael X. Delli Carpini, director of the public policy program at the Pew Charitable Trusts, which is sponsoring an online discussion about volunteering this fall for high school students. "There is a hope that the Internet may be a tool that can allow people to talk in a structured way about things that really matter to them and revive the impetus to say, `I want to be involved.' "
If there is such potential, government agencies have not paid much attention to it. Only 10 percent of government Web sites offer citizens a way to comment online on issues, according to a study released this month by the Taubman Center for Public Policy at Brown University. Almost none have sponsored online discussions. "Government planners have a service-deliver vision in which what they want to do is let people do tax filing, order licenses, get business permits online," said Darrell M. West, director of the center at Brown. "But they're not really envisioning the Internet as a tool to alter the relationship between citizens and officials." There are plenty of reasons to be skeptical about the Internet's power to usher in a new era of Jeffersonian democracy. For now, the medium cannot replicate the visceral thrill of being at the Javits Center as thousands of people saw their votes tallied on a big screen and cheered or booed accordingly. Such emotion may ultimately drive civic participation to a degree that semi-anonymous interactions on a computer screen cannot. Online forums are also notorious for destructive "flame" wars, a hostile form of exchange rarely seen in face-to-face settings. Stable virtual communities - Work-From-Home Moms at Ivillage.com or MSN.com's Seed Swappers, for example - tend to focus on narrow areas of noncontroversial interest. Web sites like CNN recently abandoned their political forums, where genuine debate was rare and grandstanding was frequent. It's easy to follow the top stories with home delivery of The New York Times newspaper. Click Here for 50% off. 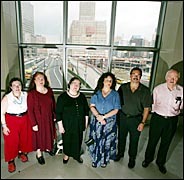 IN PERSON - From left, members of a discussion group on ground zero's future: Maria Grieco, Debra Lott, Margaret Duffy, Ellen Datlow, Vincent Pecoraro and Bill Love. Sign up to receive a free weekly Circuits newsletter by e-mail, with technology news and tips and exclusive commentary by David Pogue, the State of the Art columnist.